I was recently back in my home town of Philadelphia. It’s a great city, full of amazing history, architecture, people (we’re not as mean as they say we are) and food. The food in the city of Philadelphia is absolutely outstanding – from our street food to fine dining, we’ve got something for everyone. I will say that the category that Philadelphia potentially does better than any other city is the sandwich. Of course, most noted is the good old Cheesesteak, which while a fine and sturdy sandwich is merely the superficial symbol of the city. Much better are the hoagies, made on bread delivered just hours before and the breaded chicken cutlet sandwich, topped with broccoli rabe and sharp provolone. But in my opinion, the superior sandwich to them all is the roast pork sandwich. Served on a seeded roll, full of luscious roasted pork, garlicky greens and the sharpest provolone. Since I would never attempt to top the roast pork sandwich masters in Philly, I thought I would try to bring the flavors to you here in the form of a rich, hearty pasta dish. You still get the hyper seasoned flavors of the pork, the tang of the provolone and the healthiness (right?!) of the greens. Here we use kale, because, well, we’re in California after all! This is a dish that demands commitment – a long time to let the pork sit in the rub and a long time to cook it low and slow for the pork to absolutely melt in your mouth – perfect for a chilly Sunday. Both wines in our golden tier work beautifully with this – our Pavilion Chardonnay breaks up the richness of the dish with it’s minerality and our Claret adds to the lushness of the dish. In a large bowl, mix rosemary, thyme, oregano, garlic powder, salt, red pepper and sugar. In the bowl, coat the pork shoulder with the dry mix and wrap the bowl with plastic wrap. Let sit at room temperature for an hour and refrigerate overnight. Remove pork from the refrigerator, and let stand for 30 minutes. Heat a large cast iron skillet and brown each side of the pork. Cook pork at 425 for 20 minutes, fat side up. Add beef stock to the pan and cover with aluminum foil, turn the oven down to 300. Cook for three hours, remove foil and baste with the pan sauces. Add the cloves of garlic and b liquid and cook for another hour. Carefully remove pork from the liquid (It should be falling off the bone) and set aside. Put the liquid over med high heat, add one cup of red wine and bring to a simmer. Smash the garlic so that it incorporates into the liquid and add the sliced kale to the liquid. Fork shred the pork into the stock/kale mixture and set aside. Prepare pasta according to the package instructions and toss with pork mixture. 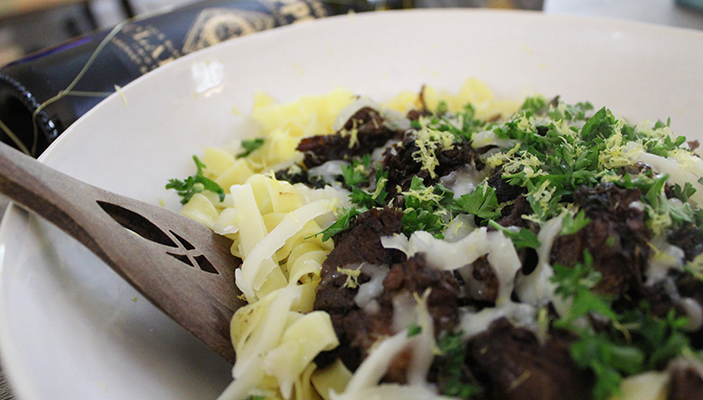 Top with shredded provolone, lemon zest and chopped parsley. 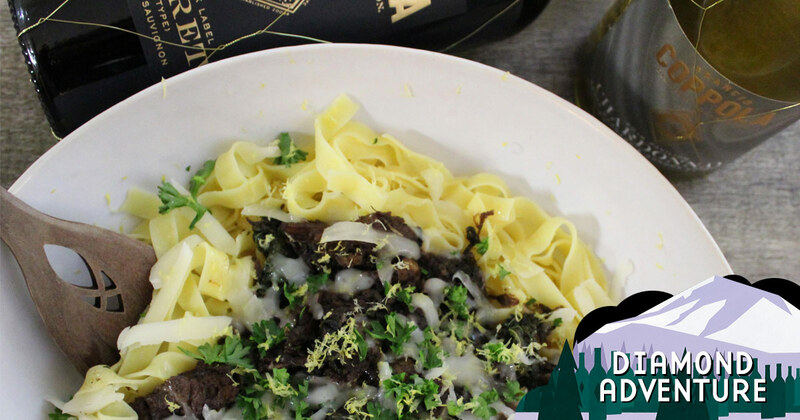 Serve with either a nice, refined Chardonnay like our Pavilion or a richer red like our Claret and perhaps eat cook along to this playlist, a mish mosh of songs by Philly artists, songs by artists who Philly loves (Billy Joel and The Strokes) and songs by Philly artists about Philly.